The current administration intends to erase federal protections under the Clean Water Act for intermittent and ephemeral streams, published in 2015 and known as Waters of the United States (WOTUS). The proposed changes severely reduce the number of streams and waterways protected, by redefining WOTUS. It excludes streams that flow only following rainfall or snowfall, and wetlands permanently connected to larger waterways. An EPA-proposed rule change to the Mercury and Air Toxics Standards (MATS) would allow an increase in the amount of mercury and 80 other dangerous pollutants spewed into the air by coal- and oil-fired power plants. Industry says it is too costly to operate with pollution controls, so as usual, Trump prioritizes profits over the health of our nation. The rule change would base compliance on cost rather than health benefits. 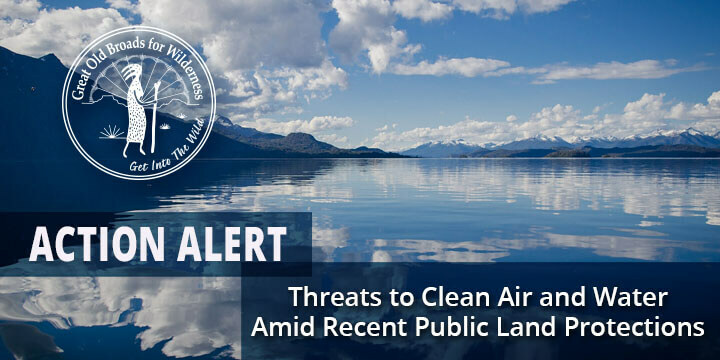 Take action to protect our air. Tell the EPA to use common sense and leave MATS restrictions in place. Signed into law last week, the John D. Dingell, Jr. Conservation, Management, and Recreation Act protects 3.6 million acres of public land and permanently reauthorized the Land & Water Conservation Fund. While we’re doing the happy dance for many of the protections awarded, as one hand gave, the other took away. We urge you to read the bill--it’s not all good news. 1.3 million acres designated as Wilderness and 2.3 million acres of public lands given protections, including four national monuments. More than 600 miles of new Wild & Scenic River designations in Oregon, Rhode Island, Connecticut, New Hampshire, Massachusetts, and California. Help us protect our wild places and our planet. Great Old Broads for Wilderness is a 501(c)(3) non-profit organization.